Optical Surfaces Ltd. is a leading international supplier of high precision spectrograph optics for astronomical telescopes. 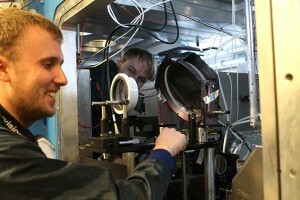 Using a spectrograph enables researchers to study the chemical and physical conditions that exist through a cross-section of space. Combined with a land or space-based telescope a spectrograph can reveal valuable information from the spectral distribution of light from a distant astronomical object. 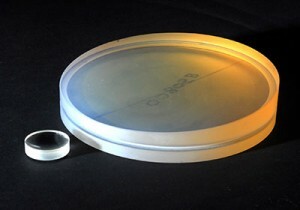 Benefiting from a unique facility, where temperatures remain constant year-round and vibration is practically non-existent, allows Optical Surfaces Ltd to produce and test demanding telescope spectrograph optics (aspheres, mirrors, prisms, lenses and flats) that stretch the limits of conventional optical fabrication techniques. Optical Surfaces Ltd has been producing optical components and systems for more than 50 years and is now accepted as one of the world’s leading manufacturers of high precision telescope spectrograph optics. The company’s ISO 9001-2008 approved manufacturing workshops and test facilities are situated deep underground in a series of tunnels excavated in solid chalk where temperature remains constant and vibration is practically non-existent. With such stable conditions testing, particularly with long path lengths, becomes quantifiable and reliable. Working with these natural advantages is a highly skilled team of craftsmen with a commitment to excellence in both product quality and customer service. Optical Surfaces Ltd designs and manufactures a wide range of mounts for use with mirrors (mirror mounts) to optimize their optical performance. Ultra-high precision mirrors are useless unless they are positioned with absolute precision and are maintained stress-free. The OS-Z range of mirror mounts from Optical Surfaces Ltd. provide ultra stable, stress-free mounting and rapid alignment of off-axis parabolic, spherical and flat mirrors as well as wedge back and parallel back mirrors. Constructed in black anodised aluminium, six models of OS-Z mount provide a secure, stable and compact platform for mirror diameters ranging from 90 to 250mm. Angular alignment can be made about two axes by means of dual action adjusters with fine screw and ultra-fine differential micrometre action. Using these mounts it is possible to align a mirror within a few arc seconds. 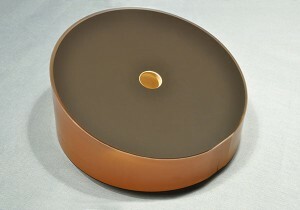 Each mirror mount comes with a base plate. As an option to the standard two-axis gimbal micrometre-driven action, OS-Z mounts can be fitted with x-y-z linear stages if required. This option allows you to control positioning of mirrors in up to five-degrees of freedom. For further information on ultra stable, rapid alignment mirror mounts please visit www.optisurf.com/index.php/products/product-6/gimbal-mirror-mounts/ or contact Optical Surfaces Ltd. on +44-208-668-6126 / sales@optisurf.com. 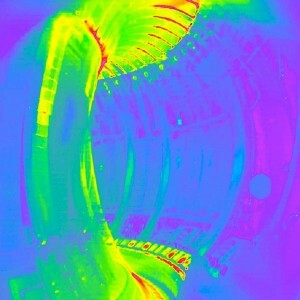 Optical Surfaces Ltd. has received a sizeable order from the Culham Centre for Fusion Energy (CCFE) to manufacture the relay imaging reflective optics that will form part of two critical viewing diagnostic assemblies for the Joint European Torus (JET) when operating with a deuterium-tritium fuel mixture. The project is funded under the framework of EUROfusion**. Comprising a series of large diameter (up to 500mm) ultra-smooth flat and spherical mirrors, some of which will have a very long radius of curvature, the relay imaging reflective optics will allow CCFE to monitor a number of physical and operational parameters within the JET fusion vessel with remote cameras from behind the 3m thick concrete shield wall. Knowledge of these parameters will ensure safe and smooth operation during JET’s planned campaign of fusion experiments using a deuterium-tritium fuel mixture. The relay imaging will be performed mainly with reflective optics because these are resilient to the hostile conditions that high energy neutrons and radiation present to them inside the Torus Hall. CCFE is the UK’s national laboratory for fusion research. CCFE is owned and operated by the United Kingdom Atomic Energy Authority (UKAEA). CCFE hosts JET – the world’s largest magnetic fusion experiment – on behalf of its European partners. The JET facilities are collectively used by European fusion scientists, co-ordinated under EUROfusion. Dr Tim May-Smith, Diagnostics Support Physicist/Engineer at CCFE, said “Selecting a supplier to manufacture the component optics was a very important decision because of the critical role that the relay cameras will play in the safe operation of JET. Optical Surfaces Ltd. was our selected supplier because of their experience and knowledge in the area of large optics, precision manufacturing expertise and value-for-money offered”. Dr Aris Kouris, Sales Manager at Optical Surfaces Ltd. commented “We were pleased to be approached by CCFE to discuss the cost drivers and limitations in the manufacturing of the optics required by this project. This allowed us to exactly understand their needs and present a proposal that secured this prestigious order”. Optical Surfaces Ltd. has been producing optical components, mounted optical components and systems for more than 50 years and is now accepted as one of the world’s leading manufacturers of large high-precision optics and optical systems for fusion research. The company’s ISO 9001-2008 approved manufacturing workshops and test facilities are deep underground in a series of tunnels excavated in solid chalk where temperature remains constant and vibration is practically non-existent. With such stable conditions, testing, particularly with long path lengths, becomes quantifiable and reliable. Working with these natural advantages is a highly skilled team of craftsmen with a commitment to excellence in both product quality and customer service. For further information on large high precision optics for fusion research please visit www.optisurf.com or contact Optical Surfaces Ltd. on +44-208-668-6126 / sales@optisurf.com. For further information on JET visit http://www.ccfe.ac.uk/ and http://www.euro-fusion.org. ** The EUROfusion consortium is the organisational body of fusion energy research in Europe, funded by the Euratom Horizon 2020 programme and additionally from EU member states. Optical Surfaces Ltd. is a leading supplier of laser debris shields (also known as protective windows or cover slides) to protect target-facing optics located in high-power laser facilities. Laser debris shields help prevent damage to the focusing optics in laser beam delivery systems caused by dust, shrapnel and fragments originating from the target during laser processing. Optical Surfaces’ debris shields offer a cost effective solution to greatly extending the service life of typically expensive high power laser refractive and reflective optics. 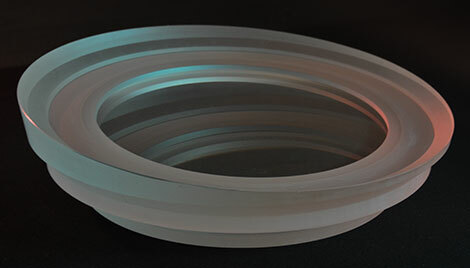 Manufacturing high quality laser debris shields combines the dual demands of producing a precision wavefront on a flexible window with a high diameter to thickness ratio. Working with a wide range of glasses, which offer good homogeneity and transmission from the UV to the Near-IR, Optical Surfaces Ltd. is able to supply laser debris shields of the optimum shape and thickness to suit your laser delivery system and target facing optics. Optical Surfaces Ltd.’s skilled and experienced craftsmen are able to routinely produce laser debris shields with high surface accuracy / quality (lambda/10 wavefront error and surface finish of 10/5), flatness and parallelism to <1 arc second. Automatic edging and bevelling on debris shields provides diamond edge finishes as per MIL-PRF-13830B, MIL-I-45208 & ISO-10110 specifications. High power laser anti-reflective coatings are available to optimise the transmission of your debris shields. For further information relating to high power laser optics and debris shields please visit www.optisurf.com/index.php/products/flats-and-windows/windows/ or contact Optical Surfaces Ltd. on +44-208-668-6126 or email sales@optisurf.com. Optical Surfaces Ltd. has delivered three challenging off-axis parabola of 175mm diameter to the UK’s prestigious Rutherford Appleton Laboratory. 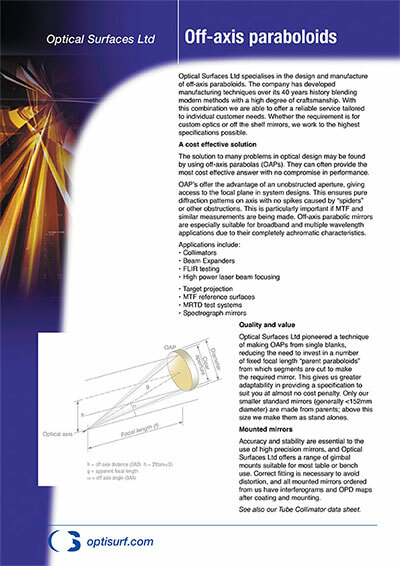 Using a new technique – Optical Surfaces highly experienced and skilled production team manufactured a very fast parent F 0.6 parabola from which 3 fast focusing off-axis parabolic mirrors with surface accuracy of better than lambda/8 P-V, surface quality of 20/10 scratch/dig and surface slope error of lambda/10/cm P-V were produced. The world class Gemini laser based at the Rutherford Appleton Laboratory, delivers Petawatt power laser pulses to targets only a few microns in size. The temperatures, pressures and magnetic fields at the laser focus reach levels that otherwise exist only inside stars, making Gemini a unique facility for scientists to conduct experiments that cannot be attempted anywhere else. Laser-plasma interactions under these conditions can produce energetic beams of electrons and protons as well as bright, coherent sources of X-rays and can also address fundamental questions in astrophysics and plasma physics. The laser focus is routinely generated with the use of precise parabolic focusing optics, which can only be made by a few companies in the world. The order for the most recent focusing optic was tendered and awarded to Optical Surfaces Ltd. The key focusing mirror was particularly challenging as it was required to have a hole through the optic, on the focusing axis. This hole facilitates the co-propagation of a much longer focal length beam enabling a whole range of additional science to be explored. Dr Aris Kouris of Optical Surfaces Ltd commented “To enable a range of new experiments on their Gemini laser, Rutherford ordered three off-axis paraboloids – one with a slanted conical hole in the centre and two without a hole. Due to tight operational constraints the delivery of the OAP with the hole had to be within a specific timeframe. 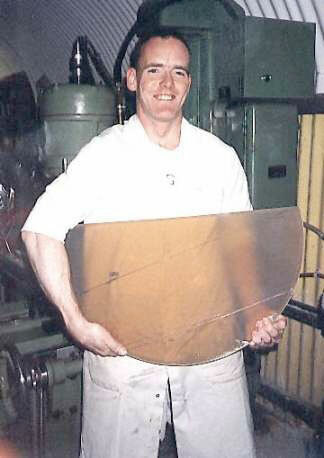 For this reason, and due to the very demanding specification for this optic, we developed a new manufacturing technique that enabled us to speed up the manufacturing time of the parent parabola significantly. The method has successful and we managed to deliver it within the requested timeframe”. Optical Surfaces Ltd has been producing optical components and systems for more than 50 years and is now accepted as one of the world’s leading manufacturers of high-precision optics for high power laser research facilities. The company’s ISO 9001-2008 approved manufacturing workshops and test facilities are deep underground in a series of tunnels excavated in solid chalk where temperature remains constant and vibration is practically non-existent. With such stable conditions testing, particularly with long path lengths, becomes quantifiable and reliable. Working with these natural advantages is a highly skilled team of craftsmen with a commitment to excellence in both product quality and customer service. For further information relating to diffraction limited parabolic mirrors please click here or contact Optical Surfaces Ltd by telephone on +44-208-668-6126 or email sales@optisurf.com. Optical Surfaces Ltd. has supplied the Laboratoire d’astrophysique de Marseille (LAM) (www.lam.fr) with polished substrates to manufacture the high precision grisms that lie at the heart of a Near Infrared Spectrophotometer designed to perform red shift measurements in the forthcoming Euclid space mission by the European Space Agency (ESA). LAM is one of the largest astrophysics public research institutes in France. It combines fundamental research in Astrophysics and the development of instrumentation for space and ground-based telescopes. 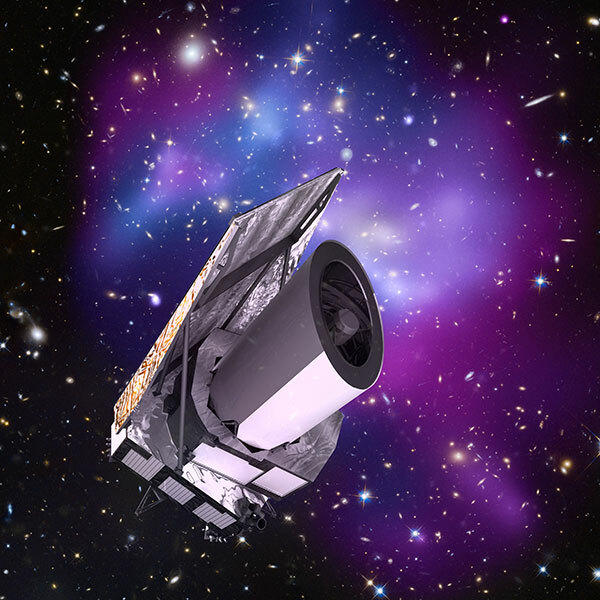 The ESA’s Euclid space mission will study the dark universe. One of the on-board probes will be a Baryonic Acoustic Oscillations (BAO) device which will measure the red shift of millions of galaxies through their Near Infrared spectra. The Near Infrared Spectrophotometer instrument that forms part of the BAO has been designed to use low-resolution grisms in slit less mode to perform this massive red shift measurement. A LAM spokesperson commented “The Near Infrared Spectrophotometer lies at the heart of making critical measurements on the Euclid mission. Consequently selection of a partner to supply the key optical components for the Spectrophotometer was a rigorous process. Our Near Infrared Spectrophotometer design requires 4 high precision grisms mounted on a wheel to allow us to measure galaxy red shifts in two spectral bands: 0.92-1.3 and 1.25-1.85 µm. Each grism is made a 140 mm Suprasil 3001 prism, manufactured from a 150 mm parallel plate onto which a grating is etched on the polished face and then the prism is manufactured”. Dr Aris Kouris, sales manager for Optical Surfaces Ltd. commented “We are pleased to have produced the substrates to manufacture the grisms that will operate in the Euclid mission Near Infrared Spectrophotometer, and in particular the surface dedicated to the grating.. Apart from high surface accuracy (<10 nm RMS), our main challenge was to develop a polishing method to routinely achieve the extremely demanding near-zero sub-surface damage required by the project. In order to achieve this, the surfaces had to be kept completely clean and free of contamination while at the same time be kept virtualy scratch-free with a microroughness well below 1nm RMS. We found that any deviation from the required cleanliness and surface quality / roughness resulted in non-perfect surfaces after chemical etching, even if the surfaces look “perfect” prior to etching. It proved that only on virtually perfect surfaces could LAM make a grating to the standards that they require”. Optical Surfaces Ltd has been producing optical components, mounted optical components and systems for more than 50 years and is now accepted as one of the world’s leading manufacturers of high-precision optics and optical systems for space and ground based telescope applications. The company’s ISO 9001-2008 approved manufacturing workshops and test facilities are deep underground in a series of tunnels excavated in solid chalk where temperature remains constant and vibration is practically non-existent. With such stable conditions testing, particularly with long path lengths, becomes quantifiable and reliable. Working with these natural advantages is a highly skilled team of craftsmen with a commitment to excellence in both product quality and customer service. For further information on high precision optics for space applications please contact Optical Surfaces Ltd. on +44-208-668-6126 / sales@optisurf.com. High precision spherical mirrors produced by Optical Surfaces Ltd. are used in a huge variety of applications including Schlieren imaging, wind tunnels, observatory spectrographs, bubble chambers and to test hyperboloids (as Hindle spheres). Benefiting from workshops and test facilities deep underground, where temperatures remain constant and vibration is practically non-existent, Optical Surfaces routinely produces high precision spherical mirrors in a wide range of materials and coatings. Typical achievable surface accuracy is better than lambda/30 p-v, surface quality 10:5 scratch dig and micro roughness less than 1.2nm RMS. A typical example of these capabilities is a 1.3-metre diameter spectrograph spherical mirror supplied to the Royal Greenwich Observatory (UK) that was installed on the 2.5-metre Isaac Newton Telescope located at La Palma in the Canary Islands. This spectrograph contributed to obtaining the first observable evidence of the existence of black holes. 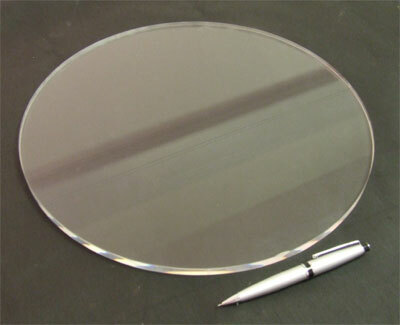 For further information on high precision spherical mirrors please visit www.optisurf.com/index.php/products/spherical-mirrors/ or contact Optical Surfaces Ltd. on +44-208-668-6126 / sales@optsurf.com. In addition to supplying a range of standard specification Off-Axis Paraboloids (OAPs), Optical Surfaces Ltd. offers a consultative design and manufacture service to produce custom OAP’s to fulfil the most demanding and specialist applications. Off-axis paraboloids, sometimes referred to off-axis parabolic mirrors or off-axis parabola, provide optical designers with an unobstructed aperture allowing complete access to the focal region as well as reducing the size and minimising the weight of a design. They are especially suitable for broadband or multiple wavelength applications due to their completely achromatic performance. All together these advantages produce a cost-effective solution for many optical design problems with no compromise in performance. Production approved to ISO 9001-2008 the quality of OAPs from Optical Surfaces Ltd. is ensured using a range of interferometric and surface test measurements on all optics leaving the factory. The company offers a wide range of coatings to enable optimised OAP performance in applications including Beam Collimation / Expansion, FLIR testing, High power laser beam focusing, Astronomical spectrographs, Target projection, MTF referencing and MRTD testing. Benefiting from a uniquely stable manufacturing environment, and over 50 years’ experience and expertise, Optical Surfaces OAPs are used by many leading research establishments and companies around the world. Optical Surfaces Ltd has produced a technical information brief that serves to provide an introduction to the company’s broad range of capabilities in producing Off-Axis Paraboloids (OAPs). In addition to supplying these standard specifications, Optical Surfaces technical team is at your disposal to discuss, propose and produce specialised custom OAP’s to fulfil the most demanding applications. 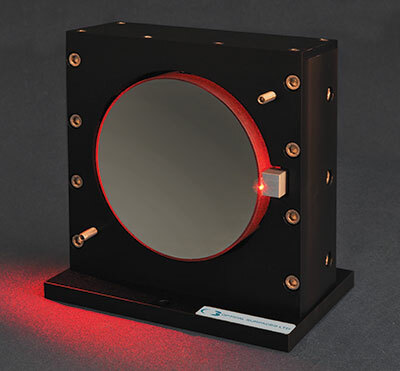 Optical Surfaces Ltd. has introduced a new option for its range of fully enclosed, pre-aligned reflective collimators. For organisations looking for the flexibility of being able to use a reflective collimator on different experiments around their laboratory – Optical Surfaces has developed self-aligning isolating feet. The isolating feet allow a ±10mm height adjustment and enable easy relocation of the reflective collimator without any loss of performance. 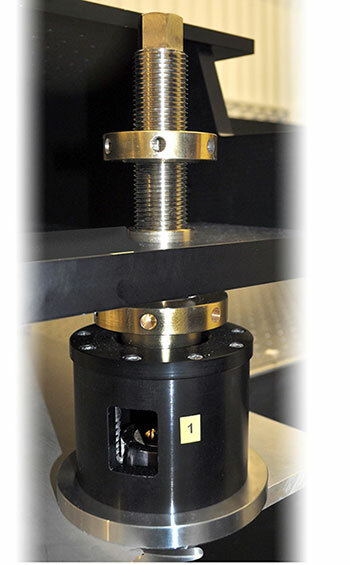 The isolating feet clamp onto standard optical tables and operate in two modes. When the unit is static the isolating feet are set in “no floating mode”. However to ensure smooth and safe transfer from one place to another the isolating feet may be set in “floating mode”. High stability and performance on Optical Surfaces reflective collimators is achieved using a zero expansion off-axis parabola, manufactured to better than lambda/10 p-v surface accuracy. The optics within each unit are secured by the use of stress-free mounts and come pre-aligned in our laboratories for optimum performance. The off-axis design of Optical Surfaces reflective collimators produces no central obscuration thereby ensuring highly efficient transmission is obtained. The all-reflecting design of Optical Surfaces reflective collimators is achromatic and with aluminium / magnesium fluoride coatings can operate from the UV to the infrared without adjustment. Using zero expansion glass mirror substrates Optical Surfaces reflective collimators provide exceptional operational stability. Each unit has an output port datum plane giving a defined distance to the focus. All reflective collimators provide a 20mm field ensuring full compatibility with standard black bodies. Standard models include exit apertures of 100mm, 120mm, 150mm, 200mm, 240mm and 300mm. Customised systems can be supplied with larger field sizes, different output interfaces and platforms. Other options include reticle holders, lamp houses and black bodies. Test interferogram and analysis, showing wavefront accuracy, focal length and working distance, are supplied with every reflective collimator supplied.